10 Simple Ways You can Help Promote Historic Preservation! News and opinions on preservation issues throughout the state. View our extensive photo gallery of historic Indiana architecture! Click here to see our book recommendations. Use this search box to find books on Indiana, history, architecture and any other subject. To help us pay our web hosting expenses, please consider making your Amazon purchases through these links. Now over 500 photos of Indiana landmarks on this site! Welcome! This site is devoted to the appreciation, restoration and preservation of great Indiana landmarks. The Indiana Historic Architecture Home Page spotlights historic architecture and neighborhoods throughout all of Indiana. Here you will find an extensive photo gallery--over 500 photos--of historic architecture, with more being added all the time. Indianapolis, Gary, South Bend, Crown Point, Hammond, Michigan City, Evansville, Lafayette--there are some great towns and cities with great architecture here in Indiana. Is this the end of historic Marktown? 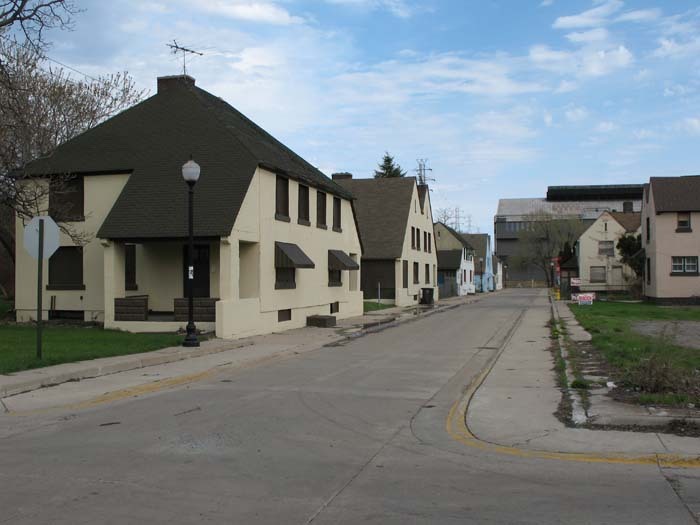 The tiny, one-of-a-kind East Chicago Indiana neighborhood was designed by noted architect Howard Van Doren Shaw as a model industrial community to house Mark Manufacturing Company employees in 1917. On the National Register of Historic Places, the community features narrow streets and English cottage style houses, duplexes and apartments. The neighborhood was featured in a Ripley's Believe It Or Not panel due to the curious fact that residents park on the sidewalks and walk in the streets. But now, nearly a dozen of the iconic houses in the neighborhood have been bought up by BP, most of them along Oak Street, likely in order to build a parking lot. The loss of such a large tract of homes could be a crushing blow for the struggling neighborhood, which is already tiny and is fenced in by BP, ArcelorMittal Indiana Harbor and US Steel’s East Chicago tin plant. Remaining residents would lose the Oak Street buffer between themselves and the sprawling oil refineries within just a stone’s throw of the neighborhood. Plus, demolitions would set an ugly precedent for the future, particularly considering that BP would like to continue buying up as many Marktown homes from existing residents as possible. Most or all the houses slated for demolition are still highly restorable if action is taken quickly enough. Unfortunately, recognition by the national register does not prevent demolitions. East Chicago seems to have plenty of money for building new residences (billboards, in fact, brag about how they are building a "new East Chicago”), but apparently there is no money to restore and preserve remaining historic landmarks. This is indicative of the throwaway society in which we live. As Marktown resident and precinct committeewoman Kim Rodriguez has said, quoted in the Post-Tribune newspaper, “We can’t make people leave. BP is waiting for the last homeowner to sell. How dare they try to take it away from us? It angers me that they can do what they want to people." East Chicago councilwoman Myra Maldano would like to stave off the demolitions and has been meeting with other council members for ways to do so. We wish her the best of luck. I journeyed to Marktown on May 4, the day before the residences were originally slated for demolition and tried to document as many of the threatened structures as possible in nearly 100 photographs, a few of which are here and the rest of which I plan to post to Flickr. "We are the only country in the world that trashes its old buildings and neighborhoods. Too late, we realize how much we need them." Historic Preservation is vitally important--now more than ever. It seems that in every community, our nation's historic architecture is under threat of some kind or another. In Gary and other urban areas, many buildings were lost due to abandonment. Ironically, in towns and smaller cities, old buildings face exactly the opposite threat. 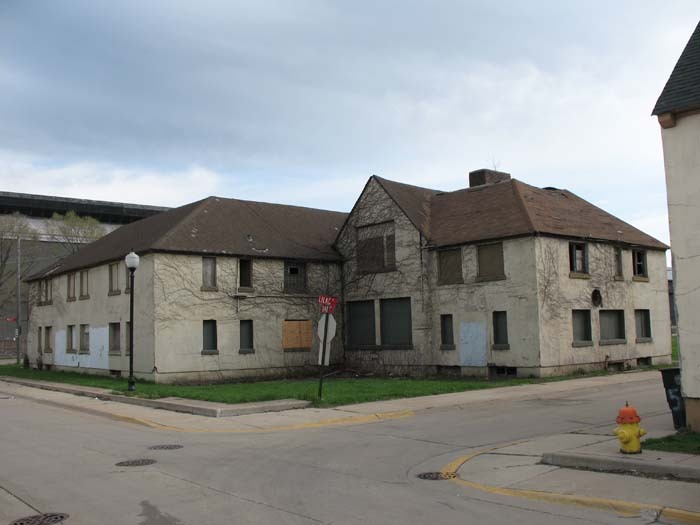 For example, some institutions in Valparaiso have moved to tear down examples of stately historic architecture to make way for "further development." In Europe, where they don't have the "throwaway mentality" we do in this country, buildings hundreds of years old are perfectly sound and still in use. The workmanship seen in old buildings is simply superior in so many ways to that used in modern construction. More importantly, historic buildings embody a distinctive form of American architecture that will never again be duplicated, and they add an irreplaceable component to the character and personality of our communities. How would we feel if every example of art from a certain period was systematically destroyed? The architecture of our downtowns and neighborhoods helps shape our feelings about where we live. THIS is why historic preservation is vitally important. The great Crown Point Courthouse is here, as well as the City Methodist Church in Gary. Here you will find several photos of downtown Hammond and downtown Hobart as well. You will also see some of the great historic homes of Crown Point and Valparaiso. But the Northwest Indiana focus is changing, thanks to generous contributions of original photos (and server space) by Mike Habeck of EcoIndiana, as he travels throughout the state documenting Indiana's environmental affairs as well as its historic architecture. There's a lot worth saving in Indiana. And a lot worthy of our appreciation as well.